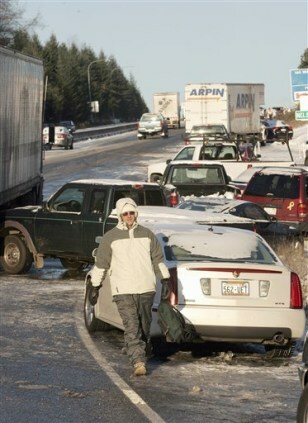 Tom Tompkins walks home after leaving his vehicle on the side of a icy Highway 303 and Nels Nelson Road on Washington state's Kitsap Peninsula on Tuesday. The chains he had for his truck were the wrong size. Around 30 vehicles were on the shoulder.